Hall's Garage is located in Bourne, Lincolnshire. With over 50 years' experience, we are a specialist in MG and other classic car repairs from small tidy ups, to full rebuild and restoration. We sell a range of classic cars and vehicles. We have even won Concourse and Condition awards due to the work we have done. Our highly skilled and experienced mechanics are able to turn even the most rusted vehicle back into a fully functioning vehicle. 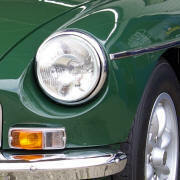 At Hall's Garage you can expect to receive expert advice on all classic cars, and all MG repairs.